main export of her vast seaborne trade, helping spread Greek culture abroad. Spirits such as brandy and rum fueled the Age of Exploration, fortifying seamen on long voyages and oiling the pernicious slave trade. Although coffee originated in the Arab world, it stoked revolutionary thought in Europe during the Age of Reason, when coffeehouses became centers of intellectual exchange. And hundreds of years after the Chinese began drinking tea, it became especially popular in Britain, with far-reaching effects on British foreign policy. Finally, though carbonated drinks were invented in 18th-century Europe they became a 20th-century phenomenon, and Coca-Cola in particular is the leading symbol of globalization. For Tom Standage, each drink is a kind of technology, a catalyst for advancing culture by which he demonstrates the intricate interplay of different civilizations. You may never look at your favorite drink the same way again. Tom Standage is a journalist and author from England. A graduate of Oxford University, he has worked as a science and technology writer for The Guardian, as the business editor at The Economist, has been published in Wired, The New York Times, and The Daily Telegraph. 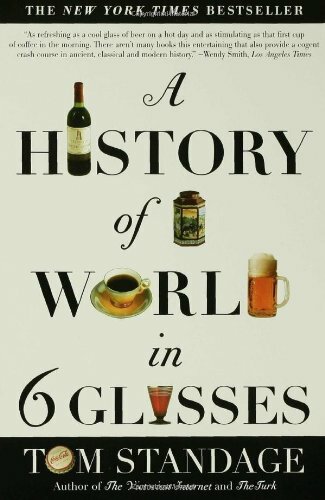 His non-fiction works include The Victorian Internet, A History of the World in Six Glasses, An Edible History of Humanity (on the New York Times bestseller list in 2014), and Writing on the Wall: Social Media -- The First 2,000 Years.